If the holy graal of the free jazz, may goes through american musicians such as Frank zappa, Ornette Coleman, John Zorn, Anthony Braxton, Peter Brotzmann, Charles Mingus or Evan Parker, going to the oriental world where important names of improvisation don't stop echoing, and where we can find musicians such as Kawabata Makoto, Otomo Yoshihide, Kenji Haino, among other, I am sure that we cannot say that we have a bad improvisation scene here in Portugal, although many times musicians rejected by the portuguese society as Carlos Zíngaro, António Pinho Vargas (in a past now in recovery), Nuno Rebelo, Vítor Rua, or Jorge Lima Barreto appear many times in an indiscrimination motion of marginalization of some of the best music that has been made in here for the last 20 years. 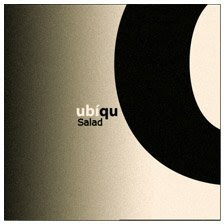 it is right that although recent, and practically hidden and limited to the anonymous identity of life in the deep of portugal this project salad, of the authory of João Clemente created in May 2007 (first recordings) that is now presented in this release, takes the notion of free improvisation with base in pre-defined structures where most of the times the line which separetes the rigid structure and the free improvisation is almost imperceptible, at an high state, so high that it may even take the risk of becoming a reference in the national scene at medium long date. It's the author's papper to create a fluxus, where the motivic gathering, in a support close to the standard, lead to all this magic, in the style of what we can see in different contexts, and with different aesthetic backgrounds, in masada recordings of john zorn in his own label tzadik just as some of Frank Zappa work if we want to go a bit more back in the past. To notice also the possibility of future releases with another formations, dued to the existance of more studio recordings, and to the high notion of social structure present in all the musical trama. The spontaneous portuguese creation is in good health and it is highly recommended - a release to be listened and re-listened and enjoyed times without count.